My youngest daughter is set on us getting another cat. We have two cats already, Princess and Misty, but Bridget thinks we need another friend for them. This time she says she wants a boy cat. She shared how she saw a cat at the pet store in the mall when she was shopping with Grandma and thinks that “Beans” should come home and live with us. I told her I’d think about it. I’d rather go to the SPCA to get a cat though and I’m not sure how well Princess and Misty would behave with a male cat. I think they’d be ok with another female, but not so sure how they would react to a male coming into the home. The decision hasn’t been made…yet. I’m giving it some serious consideration. I love animals and would always welcome a new furry friend into family. I’m just not sure if NOW is the right time. There are things I would need to do to prepare my home for the new addition. 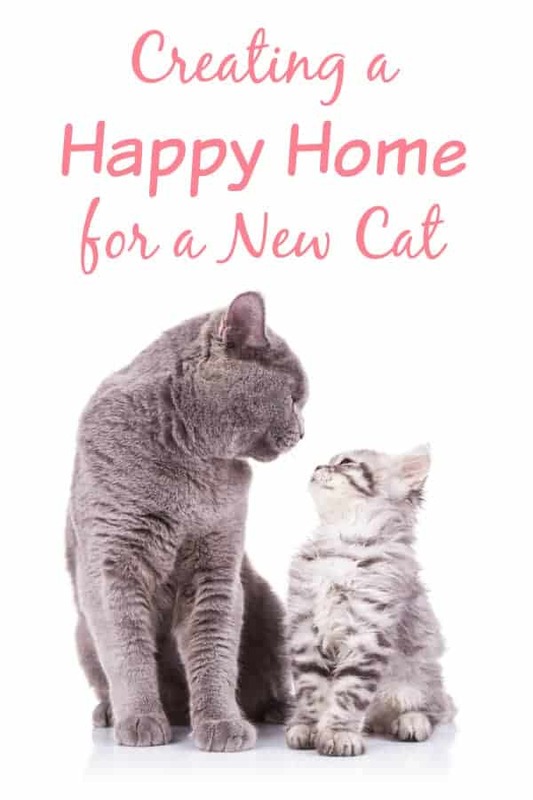 I have a few tips to share today on behalf of Church & Dwight on how to create a happy home for your new kitten/cat. These are all items that I’ll need to do once we decide to adopt a new kitten or older cat. 1. Create a comfortable space. Building a sanctuary for your new pet will make him or her much more comfortable in a new, strange environment. Make sure to have an extra litter box, food, water, toys and a soft comfy bed or blanket to rest. Get these things ready BEFORE you bring your cat home. 2. Keep the litter clean. It’s very important that you regularly clean the litter box. It encourages your cat to continue to use it. Try the new Arm & Hammer Clump & Seal Complete Odour Sealing Cat Litter in either Fresh Home or Multi-Cat. It is specially formulated with unique odour eliminators and Arm & Hammer Baking Soda for a 7 day odour free home. No other litter forms a tight seal around the the litter and destroys the smell. Princess and Misty love to watch me clean their litter box and promptly use it as soon as I’m done. Must be a cat thing! 3. Spend time with your new cat. Devote a few hours a day with your cat especially at the beginning so you can bond with him or her. You can do this by playing with them or just letting them sit with you and sleep. 4. Meeting the other pets. Let the new cat explore your home on its own without interference. It will get him or her used to the scents of the home and meet the other animals on his or her own terms. If we do decide to get a new cat, I’ll be sure to share some pictures of our new addition! Do you have any tips on how to ease the transition? My granddaughter has been asking for a new cat. I am glad you wrote this post and I will share it with her so she knows the joy and responsibilities of owning a pet. I agree. A good multi-cat litter and keeping it clean has always been they key to keeping the furry ones and not-so-furry family members happy in our home! All great tips! We have added several pets over the years but we always stick to the same gender. We have 2 cats & 2 dogs right now and they are all female and get along great. Karen, thank you for taking this friend’s cat in. I am a volunteer at http://www.northtorontocatrescue.com in Thornhill, Ontario. I know that your friend is not well and can no longer take care of her cat. If this cat was taken to some shelters they would just put it down because of its age so you are saving its life. Many are high-kill shelters and cats of all ages are only there for a certain time, then killed. I have learned through my volunteering that there are people who spend many years with their faithful companion and then the cat gets older and they no longer want it as it is not a cute kitten anymore. It is a sad reality that people will do this and the cat is confused as it has only known one home. We have several older cats that are loving creatures and would make great companions if someone would just give them the chance. Many of our cats were rescued from high-kill shelters or surrendered and have been adopted into loving furever homes. You are a good, kind person. Very good tips about introducing a new animal into the home. I wonder if a male cat would be a good idea.Making sure the cat litter is always clean in my house is a must. I think it is very nice of you to consider getting another cat. There are so many that need good homes. I agree with all of your tips above. I have only ever had one cat at a time so I can’t really help with any additional pointers but I know that the ones mentioned are a great start. My niece just got her first cat – I am sending her this post for some pointers. Thanks! Great tips! I foster a lot of kittens and have to introduce them to my household cats at some point. When they are small I put them in a carrier and let my cats sniff and get used to them before letting them run loose. The main thing is the introduction should be slow and gradual. If your daughter really wants a male you might consider getting a young kitten. Bringing a kitten into the household is easier than an adult cat. Our twin kitties joined the family 10 months ago. In addition to your great suggestions, I would like to add that feeding them high quality kitten food for a full year will be the best for them in the long term. Hope you get the kitty. Good all around tips for anyone thinking of getting a cat! If you do get a new kitty (which you so should), please post pictures!! I’ve been debating getting a cat for so long! These tips would be a huge help! Cats make wonderful pets. You have to treat them like you’d want to be treated. You need to spend time with them, have clean litter boxes available, fresh water, regular feeding time and play and cuddle time. Sometimes they want attention and other times they want to be left alone. The most important thing is get your pets spayed/neutered, microchipped and vaccinated before you even take them home. Shelter pets make the best pets in the world too. They want a forever home, please. In my experience, cats who enjoy the company of other cats rarely care what gender a new arrival is as long as all the cats are fixed. I have 2 female cats and 2 male cats right now and they are all fixed and get along just fine. I didn’t get to choose the gender or timing of the latest kitten. He was dumped by his owner’s parents who told the girl that he had escaped out the door. I found him and returned him home per the lost pet ad only to get called to go pick him back up on the threat that they would dump him again. I just wish that people would be responsible pet owners. My neighbors and I have more pets than we’d like because people keep dumping them near our homes. I think a male cat, as long as he’s neutered, might be a better addition than a female. My male cats are so much more easy going and accepting. I’m glad you’d rather go to the SPCA though, pet stores are not a good place to get pets, unless they happen to be from a rescue. Cats love to play, be sure to have a lot of toys. They also like to have their fur brushed, so invest in some cat grooming items. God luck with the new cat, if you decide to get one. It’s interesting that you’re posting this right now – my adult daughter just adopted a kitten from a shelter. The worker at the shelter said to just put the kitten in with the other cats (supervised of course) and let them get used to each other. It seems to have worked. We had to leave our cats with friends when we moved, but our son really wants to get some more now. This is a good and important post. People often get new pets at the holidays, and there are many things to consider to make it a comfortable situation for all. If you have other pets – any kind – it’s important to consider them. I’m glad that you brought up they might accept a female but unsure about male because it is very different, and you want your pets to not feel abandoned or like they have to fight for their territory and you. Good luck with a new cat if you decide to get one. When I think of getting another cat….I can’t help but think of the another box of poop to clean out. Not for me. I adopted a male cat in May to keep my female Daisy company. She’s still not convinced :0 But they’re gradually starting to get along better. a friend just got a new cat and he did all these things. Great article. New, or long time residents, I make sure I spend “”mommy”time with my fur babies. I find they know this and I do not have any problems. My niece loves cats, will share this with her! Thanks for thinking about choosing the SPCA instead of a pet store. There are already so many homeless, adoptable cats in the world, I just can’t understand how people behind pet stores can sleep at night knowing they prefer profit over the life and well-being of another living creature. I love my furrbabies all were strayed now spayed and nuetered thank goodness. Pets can give so much to you in the way of entertainment and company.I could not function without a cat. My mom is just about to get a new cat, in fact 2, because it turns out they recommend cats live in pairs if possible (excluding behavioural issues etc that would discourage this…). So that is what I would add as a tip for anyone thinking of getting a cat, if you don’t already have one – consider adopting 2. They keep each other company, and give each other exercise by playing together.